Formerly known as Fuji Heavy Industries, Subaru is a Japanese car manufacturer that was founded in July 1953. It is known for its boxer engines used to power most of its models. Also known as a flat engine, the boxer engine features horizontally opposed cylinders that are arranged in two banks on either side of a single crankshaft. It is also known for using symmetrical all wheel drive drivetrain layout since 1972. The flat or boxer engine and all-wheel drive has become standard on mid-size and smaller cars in most international markets since 1996. Subaru first appeared in Canada in 1976, the Philippines in 1996, the United Kingdom in 1974, and the United States in 1968. Subaru became the first to introduce a four-cylinder boxer diesel engine in 2007. A 2.0-liter DOHC, it was dubbed the EE20 that produced 147-horsepower ant 258-lb-ft (350 N-m) of torque. The EJ version of the engine was introduced in 1989 and included five main crankshaft bearings and four valves per cylinder. It had one timing belt and came in both SOHC and DOHC. There were two phases to the engine – phase I was from 1989-1998 and phase II was from 1999-2010. The EJ15 powered the 1990-2003 Impreza, the EJ16 was used to power the 1993-2006 Impreza, and the EJ20 powered the 2002-2005 WRX in the United States. The FA engine was developed to reduce weight and still maintain durability. The FB engine was announced in September 2010. The engine increases piston stroke and decreases piston bore resulting in a reduction of emissions and improved fuel economy while increasing and broadening torque output over the previous generation engine. It includes a timing chain instead of a timing belt allowing the valves to be placed at a narrower angle to each other providing less unburned fuel during cold starts and thus reducing emissions. The FB16 engine variation powers the 2012 and later Subaru Impreza XV and produces 113-horsepower (84 kW) at 5600 rpm and 111-lb-ft (150 N-m of torque at 4000 rpm. The FB16 DIT version produces 168-horsepower (125 kW) at 4800 to 5600 rpm and 184-lb-ft (250 N-m) of torque at 1800 to 4800 rpm. It powers the 2014 and later Levorg. The FB20 version powers the 2016 Impreza and 2017 Impreza sedan and hatchback and produces 150-horsepower (112 kW) at 6000 rpm and 148-lb-ft (200 N-m) of torque at 4000 rpm. The FB20B powers the 2011 and later Forester and produces 146-horsepower (109 kW) at 6000 rpm and 145-lb-ft (196 N-m) of torque at 4200 rpm. It also powers the 2012-2016 Impreza and the 2012 and later XV and generates 148-horsepower (110 kW) at 6200 rpm and 145-lb-ft (197 N-m) of torque at 4200 rpm. One of Subaru’s workhorse gasoline engines is the EZ Series, which was introduced in 1999 in the Japanese market for the Subaru Outback and introduced in 2000 in the United States also in the Outback. The EZ is a flat-six, 24-valve, quad-cam engine with an aluminum block and heads and is offered in two variants –- the EZ30 and EZ36. There were two versions of the EZ30D engine. The first version featured one exhaust port per head, a cable-actuated throttle, and a cast aluminum intake manifold. Only available with an automatic transmission, the engine powered the 2000-2004 Outback H6, 2000-2002 Legacy GT30, and the 2000-2002 Legacy Lancaster 6. It produced 217-horsepower (162 kW) at 6000 rpm and 213-lb-ft (289 N-m) of torque at 4400 rpm. Another workhorse for Subaru is the EJ engine, which was introduced in 1989 and continues to be used on many models. The engine is a four-stroke, 16-valve horizontal flat four, which can accommodate a single or double-overhead camshaft arrangement. Naturally aspirated and turbocharged versions are offered with horsepower ranging from 96 to 320. The J20E SOHC naturally aspirated version of the engine powers the 2003-2009 Legacy and produces 140 PS (103 kW); and the 2008-current Impreza, producing 140 PS (103 kW). The EJ203 single-overhead camshaft engine powers the 2003-2008 Forrester and the 2003-2009 Legacy 2.0i BP/BL series and produces 140 PS. The EJ204 double-overhead camshaft naturally aspirated AVCS engine has been used to power the 2003-2009 Legacy BP/BL series, the 2007-2011 Impreza GE-GH and the 2008-2011 Forester SH and produces 150 PS (110 kW). The Spectre HPR9997 replacement air filter is designed for the 2003-2017 Subaru Legacy, Liberty, Outback, Legacy III and IV and 2012-2017 XV, the Tribeca, and Impreza, 2009-2017 Exiga, 2011-2017 Thema, 2008-2017 Forester, 2012-2017 WRX, and 2005 and 2008-2010 Chrysler 300C. 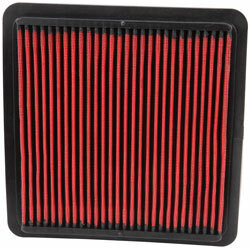 The filter features a pre-oiled non-woven synthetic steel mesh reinforced medium and premium urethane frame. It captures and holds contaminants that could otherwise damage your engine. The contaminants are held in a web of synthetic fibers until they are washed out of the filter. This assures that the high airflow is not restricted between service intervals. The air filter is designed to replace the factory air filter and fits in the factory air box. It can be installed using common hand tools.